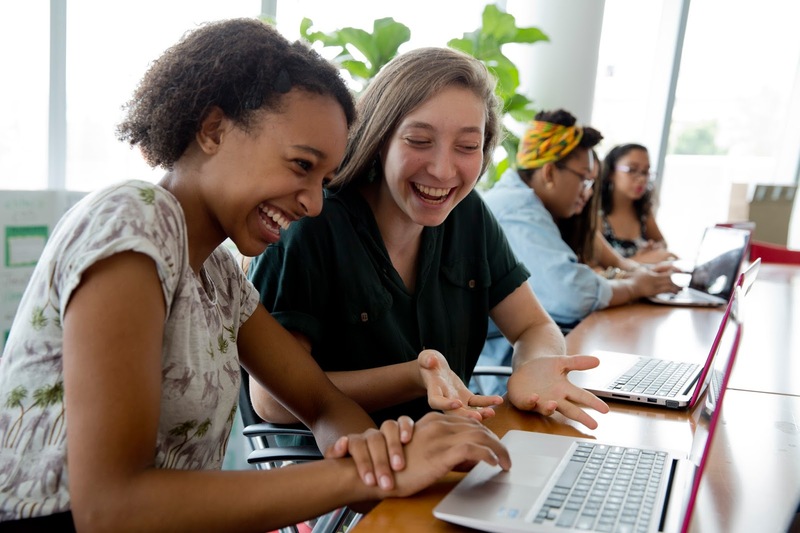 Girls Who Code Club Norfolk is part of the national organization of Girls Who Code. We are a group of middle and high school students who learn programming skills and apply what we learn to a community impact project we design. The nationwide GWC organization aims to help young women close the gender gap in high-paying computer science careers. Girls in grades 6-12 from the Hampton Roads area of Virginia. Registration for the 2018-2019 school year is now CLOSED. Slover Library hosts two sessions. Session A is on Sundays from 2-3pm. Session B is on Tuesdays from 5-6pm. To register, each girl will need their own email account, password, and access to that email account during meetings. Girls under 13 years old will need parent/guardian permission to register. We meet in the Lower Level Training Room of Slover Library, downtown Norfolk, on Sundays from 2pm to 3pm (Session A) and Tuesdays from 5pm to 6pm (Session B), September through May. Check out the eBooks for Children that the girls of Norfolk GWC developed in 2016-2017. Last year, the girls created a website designed to get the word out for Why Girls Should Code. Work on your coding skills with the free resources recommended by GWC. Girls Who Code is a national, non-profit organization leading the movement to inspire, educate, and equip girls with the computing skills to pursue 21st century opportunities. Through our Summer Immersion Program and Girls Who Code Clubs, we aim to close the gender gap in technology. The privacy of our club members is important to us. We do not share personally identifiable information about the girls and their parents/guardians with third parties. We use the information we collect for the sole purpose of enabling the girls' participation in club activities.